Earlier this month, the Muslim Students Association and the Council for American-Islamic Relations (CAIR) jointly hosted a Muslim Youth Leadership symposium at George Washington University, open to all Muslims aged 14-22. No featured speakers were publicly named for the event, but the panels and workshops are listed on CAIR's website – including the alluringly-titled, "How To Get What You Want: Politicking 101." It's an appropriate topic for a CAIR event: the Hamas-linked organization is a champion at getting what it wants," and ironically, given the nature of this event and its venue, its officials have become particularly adept of late at "getting what they want" at schools and universities. 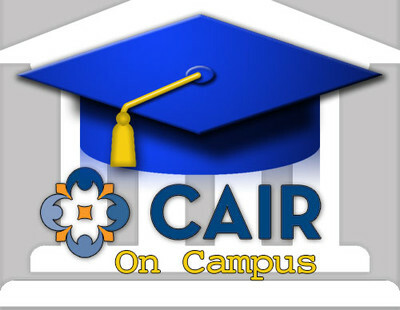 Academia, you might even say, has become CAIR's latest target, and its newest tool – not only in its campaign to silence critics of Islam – but too, to promote and spread messages of pro-Muslim hate groups among American Muslim youth. Best-known of CAIR's manipulations on college campuses is its recent success persuading Brandeis University president Frederick Lawrence to rescind his offer of an honorary degree to Ayaan Hirsi Ali, the controversial Somali-born women's rights activist whose often-strident, but deeply insightful anti-Islam speeches Lawrence called "inconsistent with Brandeis University's core values." But Brandeis was just one in a lengthening chain of such incidents. Simultaneous with the Brandeis affair, CAIR also drove Knox County, Tenn. to revoke permission for an event scheduled at a local high school, aimed, according to its organizer, ACT! For America, at informing the public about Sharia law. In a statement, Knox County Superintendent Jim McIntyre explained his decision: "The primary purpose of our school facilities is to provide a safe, healthy and comfortable learning environment for our students. When other uses of the facility begin to impinge on or interfere with the administration's ability to provide a suitable education atmosphere, it is necessary for us to reconsider that use." In response, ACT! For America observed pointedly: "Why is it that Muslims engage in teaching about how good Islam is for Tennessee at the Cedar Bluff Library – a public building – but feel 'uncomfortable' when ACT! For America plans an event to show the opposite viewpoint at a public building?" But evidently that "free expression" has its limits, at least for CAIR, which seems to find the free exchange of some ideas a threat. Take, for example, the goings-on in Ohio, where the nice people at CAIR are demanding an investigation into the activities of Oberlin College Arabic Professor Samir Amin Abdellatif, charging him with "anti-Muslim bigotry and crude stereotypes of Muslims in his writings and on campus. Abdellatif gained notoriety with the (self)-publication of his treatise, The Unknown History of Islam, which CAIR claims is riddled with "outlandish conspiracy theories about the Muslim [sic] and promotes xenophobic views about Muslim immigration to the West." Oberlin, CAIR warned the school's president in a letter, risks "tarnishing" its reputation by keeping the tenured Abdellatif on its faculty. But Abdellatif's colleagues see it differently, according to a source I contacted at Oberlin. Rather, he is known for emphasizing stereotypes of all kinds in his lectures, based on the belief that all stereotypes contain a kernel of truth. "That is what he teaches," according to my source. "So if Abdellatif's academic thesis about stereotypes is taken out of context, I suspect it could be seen as promoting anti-Muslim bigotry and crude stereotypes." But then, taking anything out of context can be viewed in any way one wants to twist it. In truth, it is not Oberlin's reputation Abdellatif stands to tarnish, but that of the school's French Professor Ali Yedes. A Muslim, Yedes, who has been embroiled in several lawsuits involving the college, now stands accused of sexual harassment, and of issuing death threats to fellow French professor Eunjun (Grace) An. Ms. An is now suing the college for failing to protect her from his menace. Yedes accused An of "betraying" him in January, 2006, and informed her that "in his culture, he could have her killed because of his perceived mistreatment by her," the lawsuit said. Abdellatif, who claims that Yedes also told him he planned to kill "an Asian French professor at Oberlin," is a witness in her suit. It gets more complicated. CAIR says Oberlin is also trying to fire the tenured Yedes, who serves as an adviser to the school's Muslim Student Association (MSA) – a national group with ties to the Muslim Brotherhood. And the school is counting on Abdellatif to testify against Yedes on their behalf. Could this be why CAIR wants him gone? It is striking that an organization that claims to stand for justice and civil rights has done nothing to reprimand Professor Yedes for his alleged threats against Professor An. Or do their officials not view his statements, like Abdellatif's, as "outlandish" misrepresentations of Islam? Do they feel it is appropriate for students to be exposed to his views (as they are alleged), but not to those of ACT! For America – or, for that matter, Samir Abdellatif? Perhaps so. CAIR officials have never indicated concern about the well-being of students exposed to the ideas expressed by various speakers at colleges around the country, all invited by local MSA chapters –speakers such as Abdel Malik Ali, who in 2006 told an audience at Chaffey College that Zionists, not the Danes, were behind the controversial Danish cartoons that caused worldwide rioting among Muslims that year. Nor did they seem distressed when Mohammed Al Asi also condemned Israel and the Jews at the University of California, Irvine, stating, "It's about time we begin to open our eyes, see for ourselves, and identify this cancerous presence of the Israeli interest that has taken over the American body politic." But maybe this is all part of what CAIR sees as "How To Get What You Want:" promote what you want people to hear, censor the rest, and manipulate the law and Constitution to serve your purposes. However, if CAIR plans to teach Muslim youth in America that they can and should use bullying and propaganda to "get their way," it is all the more important that we teach them otherwise. Unless we do, we'll find that they grow up to be, like CAIR itself, far more Islamist than American. And that is a risk we can't afford to take. Guest Column: CAIR'S HYPOCRISY at America's Schools. Well this is being done all over Europe this is how Cair is quietly taking over the US too. This is their well honed methodology and it works where ever they set up shop. Cair owns the Middle East they control everything behind the scenes pretending to be the good guys. These colleges are going to pay a heavy price when their female teachers are ordered to cover their hair and are treated like second class citizens with no rights in their own country. I can see the lawsuits now. Al Asi has spoken at UC Irvine a few times and once in my presence. (In 2001 he told his audience, "You can take the Jew out of the ghetto, but you can';t take the ghetto out of the Jew." I believe you have the video in your archives.